Sleek, stylish business rotary card file holds 500 double-sided cards that feature alternating gray and white entry fields for easy reading. Supplied with 25 rugged alphabetical dividers. Black/graphite. 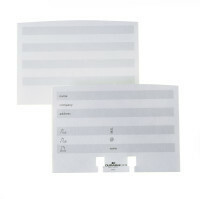 Double-sided address cards with alternating gray and white entry fields for easy reading. Compatible with all TELINDEX®/VISIFIX® flip and desk files. Pack of 100.